The idea for Organic Yeshiva originally came to me when I was studying full-time at the Pardes Institute of Jewish Studies in Jerusalem, the “open and pluralistic yeshiva” mentioned in R. Schwarz’s essay, which serves as a mecca for young Jews looking to deepen their understanding of the Jewish tradition. Each year, Pardes would take one day out of the calendar year of learning and dedicate it to various chesed projects. My first year there, I signed up to join a group picking oranges to be delivered to food banks and feeding programs for people in need throughout Israel. As much as I was motivated by the opportunity to help others, what excited me most, after spending long hours studying in the depressing fluorescent lighting of the beit midrash, was the opportunity to spend a day outside doing physical labor. After several hours of picking oranges I felt physically tired, but spiritually invigorated. I felt that parts of my being which had been lying dormant in the beit midrash were able to come to life and sing when we spent the day working outside. I was feeling more energized and eager to learn than I had felt in weeks. I thought to myself on that bus ride “wouldn’t it be wonderful if there were a program where one spent half the day working outside and half the day studying Talmud?” There is no reason that serious learning should demand that people check their physical selves at the door. A seed was planted in my mind. It was the summer of 2014, several years later, when I ran a pilot season of Organic Yeshiva. My goal was not just to create a healthy balance between intellectually rigorous study and physically rigorous work. Much of my thinking in designing the program, and much of what I think about now as I lay the ground work to bring the program to Sacramento, revolves around ways to address some of the four proposals described in Jewish Megatrends. Most prominently, I wanted to create a program that would help Jews tap into the deep chochma of the Torah in areas related to farming and environmental ethics, going beyond a superficial reading of a few verses from Genesis and bal tashchit (the mitzvah not to waste). I wanted to create a program where we looked at not only sources related to farming, but the laws of damages, property rights and zoning from the Talmud, as key sources of Jewish environmental wisdom. I wanted to look at the words of prophets like Jeremiah as a model of what happens when people deliver a message that society doesn’t want to hear. I wanted to develop a program where people who might not be comfortable going to learn in a traditional yeshiva could nonetheless access the wisdom of our tradition. I imagined attracting participants who might have just come out of one of the many JOFFEE programs that now exist around the country, who might be ready to take that experience to the next level with a program that incorporated a serious text learning component. Organic Yeshiva, as it is presently conceived, is a short-term program. As such, it cannot fulfill the need for community in the same way that a long-term community can. However, a short-term community can be a real community, a place where people are genuinely supported and cared for, even if it lacks the longitudinal perspective of a more settled community. Also, based on my experience with short-term programs like Adamah and Pardes, the friendships formed in short-term intensive communities, often form the basis for long-term communities as people stay in each other’s lives. Sometimes those shared interests even lead people to collaborate, work or live together. At Organic Yeshiva, we cultivate intentional community by holding regular community meetings, sharing meals, holding weekly Skill Share evenings when participants have a chance to learn homesteading skills from one another. We collaborate on cooking and other household chores. We also cultivate connections to the wider community by holding a community beit midrash in the evening once a week, when members of the larger community are invited to learn with us and by hosting Shabbat meals to which we invite members of the larger community. Organic Yeshiva is also dedicated to cultivating a sense of kedusha, which R. Schwarz defines as “holiness/ transcendent meaning/a sense of purpose.” Our day begins with hakhanah la`avodah, a group spiritual practice that serves as preparation for the work day. This can be almost anything that the leader thinks will serve to bring the group together in the morning, set a positive tone for the day and help wake up the physical and/or spiritual body to prepare for the day’s work. In practice, it has taken the form of Chi Gong exercises, reading of psalms, journaling in response to a prompt, and even an early morning dance party. This, combined with the fact that we are explicitly seeking to create a holistic experience, one that integrates body mind and soul, where learning doesn’t come at the expense of health, where community doesn’t come at the expense of other values, helps fuel a sense of purposefulness and meaning which is at the heart of kedusha. I sometimes joke that the goal of Organic Yeshiva is to help Jews who are at home in their bodies and the outdoors discover the texts of our tradition, while helping Jews who are at home in the texts of our tradition discover their bodies and the out of doors. The truth is that Organic Yeshiva is about the search for wholeness (sheleimut), for an integration of the physical, intellectual and spiritual realms. All too often, our religious institutions and experiences privilege one of these modes of engagement at the expense of the others. My hope is that Organic Yeshiva will serve to demonstrate that physical, hands-on experiences, intellectual inquiry and spirituality, far from distracting one from the other, are in fact, complementary pursuits. 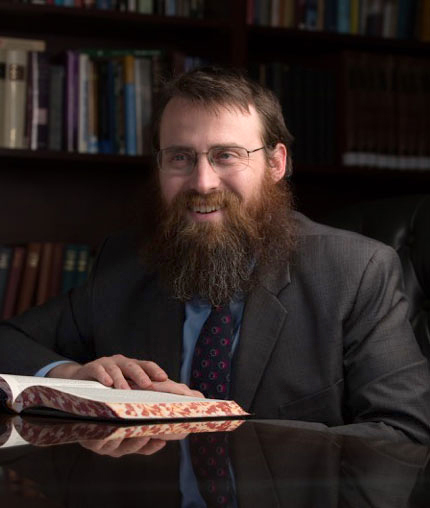 Rabbi Garth Silberstein received rabbinic ordination from Yeshivat Chovevei Torah in 2016 and serves as the rabbi of Kenesset Israel Torah Center (Sacramento, CA). An outdoor enthusiast, Rabbi Silberstein twice staffed Hazon’s Cross-USA bike ride from Seattle to Washington, DC and in 2014 founded Organic Yeshiva, an immersive adult education program combining traditional Talmud study with hands-on experience in sustainable agriculture.